My doctor thought maybe he felt the start of a hernia and referred me to a surgeon who agreed. He said we really can’t diagnose it without a CAT scan. I thought about it for a few days and decided to go ahead with the CAT scan. After the scan the tech told me I could call my doctor in 24 hours. The radiologist would read the scan this evening and send it to the surgeon. So I went home and finally had my first food of the day. Imagine my surprise when the surgeon called me and asked if I had eaten yet. He said no hernia, but my appendix was enlarged and he recommended taking it out. So the surgery was scheduled, sort of unusual for an appendectomy, which is often an emergency surgery. I was planning of getting up a 5 am, but Dean came and woke me at 4:30, he said the septic is backed up and he had to turn off the water so I couldn’t take a shower. Dean was able to get some warm water from the hot water heater so I could wash off a little and we went to the hospital for surgery. It turns out it was early appendicitis, so I was very fortunate. The hospital staff were wonderful and after my recovery my daughter suggested I stay with her until we had water at our house again. Our granddaughter, Miss Number One, gave me her stuffed animal she sleeps with, in case I wanted to take a nap and then she read me stories. She was just adorable. My grandson ( Mr. Number Three) was just as cute, he brought me his blanket and stayed close by. He gave me his triceratops to take home. 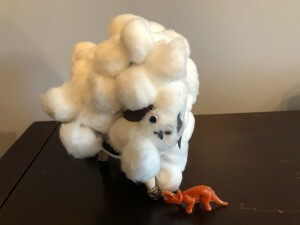 Granddaughter, Miss Number Two, gave me her sheep that she had made in her homeschool class. Dean came and picked me up after he had gotten the water back on at home. I can still feel the warmth of their love. But I’m glad to finally be home. So you just never know! Posted by Maryclaire Mayes on Thursday, March 29th, 2018 at 06:03 and is filed under General.